We, TechnoValue Solutions Pvt. 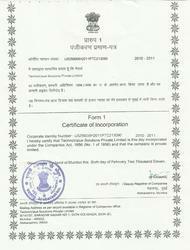 Ltd., started operations in the year 2011. Our offered, ventilation and HVAC test tools such as Ventilation Test Equipment, Indoor Air Quality Instruments, and Heating Ventilating & Air Conditioning Test Equipments are highly liked by the clients. We have acquired expertise in the supply of analog barometer capture hoods, which are known for quick, air volume measurements and simple readings. Further, our supplied, multi-function indoor air quality meter is capable of measuring the carbon dioxide and carbon monoxide concentration in air. Additionally, our traded, duct leakage tester is capable of measuring the air volume and flow leakage rate. We also offer maintenance and repair service of our quality product. We are exporting our quality products in USA and Finland. Our vendors are the most reputed companies in the world such as S & M Electronics Limited, Nedo Precise Surveying and Measuring and Stonex Positioning. Further, our quality assurance department inspects and tests the ventilation testing systems, before delivery to the clients. Additionally, our offered ventilation testing systems are appreciated for high trueness of the measurements. Further, our traded, ventilation testing systems are commonly used by the automobile industries, food industries, and educational institutes, across the country. Additionally, our clientele includes shipping companies, aviation companies, traffic department and fire department, across the country. We are greatly indebted to our manager, Ms. Laxmi Nair, who has always maintained a good administration for smoothly carrying out the business operations. Our complete workforce wishes that he consistently manages and administers the business unit, forever. We are backed by a big vendor base for the procurement and sourcing of ventilation testing tools. Further, our vendors are liked for manufacturing high grade, ventilation testing tools. Additionally, our vendors are very supportive for getting the ventilation testing tools, tested and inspected before dispatch to our facility. Further, our vendors are very reliable and trusted names in the industry. In addition to it, our vendors are capable of completing the bulk orders within predefined time limits. To be recognized as the complete solution partner offering unique value in Engineering and Technology products and Services. To be innovative solution providers to the customer using energy-efficient, environment-friendly & cost effective methods in order to become the prominent service provider of metrological & technical services. We are a market focused, technology driven organization that develops and delivers innovative and technical solutions for the industry. We delight our customers with 'Concept to Completion' solutions which ensure the greatest possible technical value creation. Safety: We will provide a sustained safety culture that mitigates risk to the client and to our employees through risk identification and assessment, planning and controlled execution of our work as a solution partner. Clients: We feel it is a privilege to work for each of our clients and we are committed to excellence in all facets of our work to ensure their repeat business. Integrity: Our actions and decisions will reflect the highest ethical standards. Innovation: We develop, implement and share new ideas, creative solutions to the industry. Our organization is backed by an expert team of quality assurance staff, administrators, and marketing personals for carrying out the business operations. Further, our employees are the most experienced and expert professionals. Additionally, our marketing and sales staff is keen enough to keep our name among the front runners of the domain. Further, we have gained new clients, owing to the unmatched reputation and with the existing client companies. Additionally, we have reached the present position in the market, due to the superhuman efforts of the workforce. We have become a trusted and known name in the market. Additionally, we have gained new clients, across the country, due to our quality deliveries and fair deals. Further, our offered, ventilation testing equipment is flawless in design. Additionally, our team is zealous and motivated to always outdo the client expectations. Further, we offer multiple payment modes to the client companies, for simplifying the payment process.